In this Sunday's readings, we hear of the stark contrast between water that quenches physical thirst and the "living water" that quenches our thirst for the fullness of life with God for all eternity. In our first reading (Exodus 17:3-7), we hear how the Israelites grumbled in the desert about their thirst for water and how God responded in his mercy. In those days, in their thirst for water, the people grumbled against Moses, saying, "Why did you ever make us leave Egypt? Was it just to have us die here of thirst with our children and our livestock?" So Moses cried out to the LORD, "What shall I do with this people? a little more and they will stone me!" The LORD answered Moses, "Go over there in front of the people, along with some of the elders of Israel, holding in your hand, as you go, the staff with which you struck the river. I will be standing there in front of you on the rock in Horeb. Strike the rock, and the water will flow from it for the people to drink." This Moses did, in the presence of the elders of Israel. The place was called Massah and Meribah,because the Israelites quarreled there and tested the LORD, saying, "Is the LORD in our midst or not?" In our Gospel reading (John 4:5-42),we hear the story of the Samaritan woman who encountered Jesus at Jacob's Well. In their conversation about water and thirst, the woman is led into a deeper understanding of who Jesus is and the true nature of the "living water" of which he speaks. Her increasing understanding and faith led her to lead others to Jesus - a mission we are called to as well. Jesus came to a town of Samaria called Sychar, near the plot of land that Jacob had given to his son Joseph. Jacob's well was there. Jesus, tired from his journey, sat down there at the well. It was about noon. A woman of Samaria came to draw water. Jesus said to her, "Give me a drink." His disciples had gone into the town to buy food. The Samaritan woman said to him, "How can you, a Jew, ask me, a Samaritan woman, for a drink?" -For Jews use nothing in common with Samaritans.- Jesus answered and said to her, "If you knew the gift of God and who is saying to you, 'Give me a drink, ' you would have asked him and he would have given you living water." The woman said to him, "Sir, you do not even have a bucket and the cistern is deep; where then can you get this living water? Are you greater than our father Jacob, who gave us this cistern and drank from it himself with his children and his flocks?" Jesus answered and said to her, "Everyone who drinks this water will be thirsty again; but whoever drinks the water I shall give will never thirst; the water I shall give will become in him a spring of water welling up to eternal life." 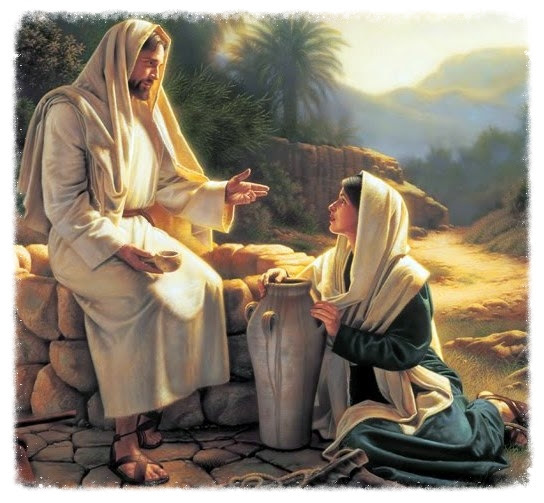 The woman said to him, "Sir, give me this water, so that I may not be thirsty or have to keep coming here to draw water. "I can see that you are a prophet. Our ancestors worshiped on this mountain; but you people say that the place to worship is in Jerusalem." Jesus said to her, "Believe me, woman, the hour is coming when you will worship the Father neither on this mountain nor in Jerusalem. You people worship what you do not understand; we worship what we understand, because salvation is from the Jews. But the hour is coming, and is now here, when true worshipers will worship the Father in Spirit and truth; and indeed the Father seeks such people to worship him. God is Spirit, and those who worship him must worship in Spirit and truth." The woman said to him, "I know that the Messiah is coming, the one called the Christ; when he comes, he will tell us everything." Jesus said to her, "I am he, the one who is speaking with you." Many of the Samaritans of that town began to believe in him. When the Samaritans came to him, they invited him to stay with them; and he stayed there two days. Many more began to believe in him because of his word, and they said to the woman, "We no longer believe because of your word; for we have heard for ourselves, and we know that this is truly the savior of the world." In our Epistle reading (Romans 5:1-2, 5-8), St. Paul reminds us that this grace that God has given us through the passion and death of his son Jesus is truly unmerited and given purely out of the love God has for us, even while we were still sinners. Brothers and sisters: Since we have been justified by faith, we have peace with God through our Lord Jesus Christ, through whom we have gained access by faith to this grace in which we stand, and we boast in hope of the glory of God. And hope does not disappoint, because the love of God has been poured out into our hearts through the Holy Spirit who has been given to us. For Christ, while we were still helpless, died at the appointed time for the ungodly. Indeed, only with difficulty does one die for a just person, though perhaps for a good person one might even find courage to die. But God proves his love for us in that while we were still sinners Christ died for us. In some ways, we may be like the Samaritan woman and the Israelites in the desert, with our minds fixed on our physical needs while Jesus is leading us to thirst for our spiritual needs, the fullness of life in him. Would it be that we were as quick to recognize Jesus as the Samaritan woman.